← Thwart robbers with an old smoke alarm. I think you mean 7200.11s, not 2700.11s. FFS I just threw away my 500gb seagate drive 1 week ago…………………………………. I’ve used a little USB-to-RS232-to-TTL FTDI board from SparkFun to fix several 7200.11’s over the past few months, using these instructions. Works like a champ. 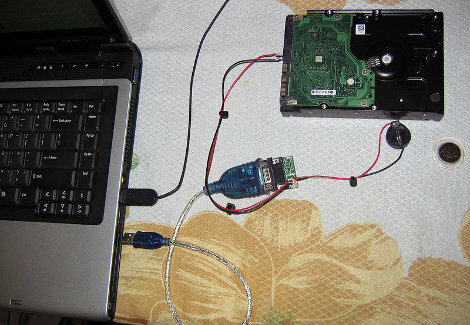 When mine borked (it was in an external enclosure) I simply installed it in my desktop PC and did a firmware update on it. I had to get ahold of Seagate to get the correct file, but it worked perfectly. Total time for the procedure, including emailing their tech support, was about two hours. Maybe I missed something, but nothing seemed complicated (other than the commands) or expensive.. This happened to my girlfriend’s PC last week. Fortunately we got it going again using a guide similar to this. @RustyBadger: drives with the BSY flag error cannot be powered up at all until this fixing procedure is done. Then you can install a working firmware afterwards. I was the victim of my 1TB Barracuda drive getting stuck in the BSY state. I seriously considered the DIY fix (which is by no means new, I don’t see why this deserves a posting here), but I decided to see what Seagate is doing about all of this. Five days ago I called Seagate support (go to warranty extension on the phone). Email support was incredibly useless, they gave me a link to the firmware update and closed the case –and a second time after I reopened it. Anyway, I had a short talk with the warranty guy, let him know I know what I’m talking about, and he confirmed the drive had the firmware problem. He transferred me to the technical line where the problem was once again confirmed and I was given the phone number to i365, the Seagate data recovery people. Slightly confusing here, just dial 0 for “other”. Give them your case number, they’ll give you a website to apply to to have it sent in. They pay $5 for packaging at UPS Stores, it’s free shipping OVERNIGHT to one of their facilities and they let you know when it comes in and how the job went. They send it back UPS ground. It’s coming Tuesday, all my partitions restored, no risk involved (on my end). I can assume their process is very similar to the DIY method, and while it’s nice to know I could have done it myself easily enough, I didn’t have all the necessary hardware on hand and this just seems easier. The only thing is that they do a sector-by-sector imaging of the disk and keep it for 14 days (then to be overwritten), which I’m not a fan of but I’m sure it’s just standard procedure. Just unnecessary. Why is everybody using hyperterminal? Why not putty for instance? Old news. There was a good writeup on this available a year ago. Used that to fix my 7200.11 that died last Easter. Putty is a great program… but is not include in almost every iteration of windows. This is probably the main reason people use it in these projects instead of putty. It’s the type of mentality below that causes the KISS (Keep It Simple Stupid) principal to kick in. …is this perhaps due to my comment on the cellphone –> tll post? This is my favorite hack in ages and it has proved very useful! Wow, amazing timing. I lost a harddrive with this exact problem not 4 days ago, and I already had plans in a few hours to go take this to professionals to look at. I’ll dig into this and I’ll report back on how it went. Thank you Hackaday this saved the last 3 years of my life, and my 750gig. It died about a month ago and I used it to backup all my import work. bsy fix works. m0,2,2,,,,0 not responding, and yeah i had to switch off and on again..except my drive bcame RAW afterwards. Recovering my files right now. they tell you don’t switch off at partition regen but what if the drive takes days to do it?? it did for me and no response watsoever!! I had the same problem. were you able to recover the data?